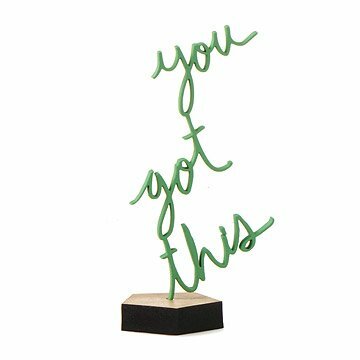 Wise words spring to life in these bright desk sculptures. Artist Matthew Hoffman draws and then laser cuts uplifting phrases out of birch plywood. Highlighted by a vibrant finish and letters that climb, each pedestal-footed design is signed by the artist himself. Handmade in Chicago, Illinois. This is a great gift for anyone going through anything, from a rough patch at work to a divorce. my friend LOVED her gift. Thank you!! I bought one of these for my desk and loved it so much I got one for my husband for Christmas. He loves it. Beautifully made and perfect to sit by a monitor as a reminder. It is fragile though. My item arrived perfectly packaged and intact. I agree with others, it was smaller than expected. I have it sitting next to my desktop monitor; but I do love it. The little "statue" is unique and creative, however, it is very fragile. Mine arrived broken the first time and Uncommon Goods was very responsive and sent out a second one. This one arrived broken in the same place and ditto for the third one.I have given up on this product...it is too bad because I was looking forward to displaying it on my nightstand. I just love this little piece of word art. It's delicate, but with lots of impact. Beautiful execution. The words themselves are very flexible, so I think it should even survive a bump or two on my kitchen counter. Inspirational. So glad I treated myself to this. While this product is neat, it's too small and way too fragile. Mine arrived broken. I glued it back together only to find it was cracked in another place. Glued that back together as well. So, the end result is that your see two places that were glued. Was way too expensive for the quality of product.